This year we're pulling out all the stops at Laurie Lewis' annual late November show, as Thanksgiving festivities combine with a celebration showcasing her brand new CD, Skippin' and Flyin' (Spruce & Maple). A lively, heartfelt homage to the late, great bluegrass patriarch Bill Monroe, this album brings together a fine mix of songs by Monroe himself, plus tunes by Jimmie Rodgers, Maybelle Carter, and Del McCoury, and a gorgeous selection of Laurie’s own originals. Backing her expressive vocals, guitar and fiddle talents are mandolinist and singer, Tom Rozum, fiddler Chad Manning, banjo ace Patrick Sauber, and bassist Todd Phillips. 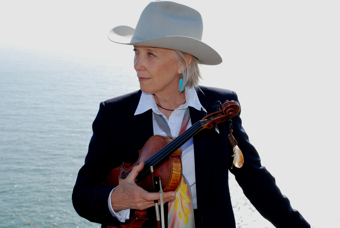 Through her many band and solo outings, Laurie has become a key figure in bluegrass, traditional, and folk music. A native Berkeleyite, her songwriting, fiddling, and crystal-clear singing have brought her national recognition, a Grammy, and two International Bluegrass Music Association Awards for Female Vocalist of the Year. Join Laurie & company for a generous serving of heart-lifting music to warm the spirit as the year turns toward winter.